A new spring has arrived with bright prospects for Vietnam, whose position on the international stage has never been as strong as today. The past three years have seen complicated developments in the global economy, with trade disputes between major countries and the rise of protectionism threatening a deeply integrated Vietnam, but the country has been able to maintain stability and record rapid economic growth. Vietnam’s economy expanded by 7.08% in 2018, the fastest rate in over ten years, while inflation was kept in check at 3.54%. The country’s exports rose to US$244.7 billion, up 13.8%, far exceeding the 7-8% target set by the National Assembly. Foreign direct investment pledges reached US$35.46 billion and disbursement hit US$19.1 billion. Vietnam’s foreign reserves were estimated at US$60 billion. Such impressive results were thanks to the government’s sound policies and aggressiveness in their implementation over past years. Since the start of the year, the PM has requested that ministries, agencies and localities seriously and quickly carry out Resolution 01 on key measures to implement the socio-economic plan. The government also held important conferences aimed at seeking specific measures to deal with the difficulties facing various sectors such as construction, high-tech agriculture, rice, logistics, innovations and foreign investment. The PM directly chaired investment conferences in many provinces and cities as well business forums with foreign partners in order to expand economic cooperation, investment and export. The above-mentioned events played a major role in helping Vietnam locate new drivers of growth for 2018 and subsequent years. The government and the PM not only paid attention to the pace of economic growth but they were also aware of the need for sustainable growth. Rapid economic growth has afforded the government the resources to ensure every member of society can enjoy the fruits of growth with no one left behind. 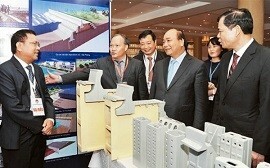 Thanks to that, Vietnam’s position on the regional and international stage was enhanced. Major international organisations such as the World Bank, the International Monetary Fund, the Asian Development Bank and the World Economic Forum have all highly praised Vietnam’s economic achievements and efforts to improve the business environment, citing Vietnam as an example for developing economies. Last year was also noted for the spirit of an honest, facilitative and people- and business-oriented government. All the policies and directives of the government were aimed at serving the people and the business community. The government was closer to the people, interacting with and accompanying them. At a recent meeting with the PM, a voter in Hai Phong stated that the small fire of building a facilitative government set on by the PM has now grown into a big fire spreading across the country, even to the grass-roots level. The voter also stated that what needs to be done now is to bolster the people’s confidence, adding that the public would like the fire to continue spreading in the New Year. At the question and answer section of the past National Assembly plenary session, PM Phuc spent a significant amount of time on highlighting that the government needs to be much closer to the people in order to understand their lives. 2018 was also a busy year for the Prime Minister’s working group, which impelled ministries, agencies and localities to actively fulfil the tasks assigned to them. Thanks to that, many ministries took bold actions to cut business regulations and goods inspection procedures so as to remove obstacles and create conductive conditions for businesses and the people. The government leader also spent his time on dialogues with the workers at industrial parks in the Red River Delta, through which the PM and ministers were able to directly comprehend the feelings and wishes of the workers such that they can further fine-tune the policies towards the people. The Prime Minister was also deeply concerned about the fact that a number of civil servants are indifferent and insensitive to the people’s lives, and that the central government was very aggressive while lower-level authorities remained rather apathetic. At the same time, corruption and bureaucratic behaviours have remained major problems. As such, in response to the Party’s anti-corruption drive, the government was also a leading advocate of this campaign. The government leader expects the entire political system to join forces in bringing to light anyone who has committed wrongdoings without a “prohibited zone”. Citing the words of General Secretary and President Nguyen Phu Trong that there is no room for complacency with the victories, the Prime Minister affirmed that the government has clearly identified the difficulties, challenges and drawbacks and outlined an action programme to deal with pressing problems. In the joyful atmosphere of a new spring, all members of the public wish for a new year of happiness, health and stronger growth for the country. It is entirely believable that under the Party’s sound leadership and with the efforts of the entire political system, Vietnam can take advantage of opportunities and overcome challenges to become an independent, self-reliant, wealthy, democratic, equal and civilised country.